Intellectual Ventures Report, 2nd Ed. Intellectual Ventures Report, 1st Ed. First Edition (2007): 655 pages, identifies 362 shell companies, 247 transactions from 2001-2007, 2,069 US patents, and 754 US applications. 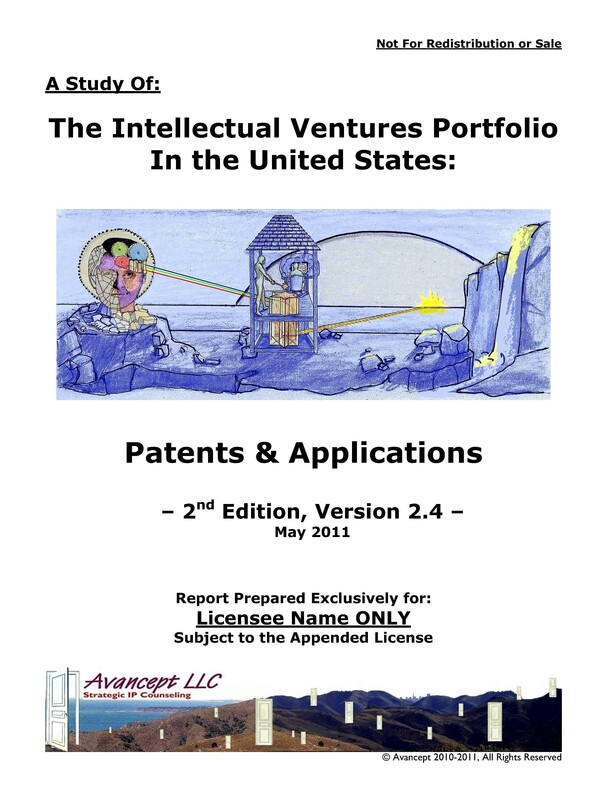 Avancept LLC created the Intellectual Ventures Report in 2007, the first publicly available report of its kind. Prior to Avancept’s report, the public perception of IV’s portfolio was that it was simply “unknown and unknowable,” even though patent ownership is publicly available information. Our Intellectual Ventures Report (2nd Ed., Version 2.4) builds on our prior work and provides 4 times the information found in the original report. Our reports have been mentioned in the New York Times, Forbes, Dow Jones Newswires, National Public Radio, and other publications. Publicly Auctioned Patent Buyers identifies the buyers of some 300 lots of patents publicly auctioned at various Ocean Tomo patent auctions conducted from Spring 2006 to Spring 2009. This report matches pricing information to buyers, where such information is available. The report also confirms and rejects various rumors about these auctions. Among the rumors confirmed are that IV purchased the lion’s share of patent lots sold. We find that IV bought nearly 76% of the lots sold, with the remaining 24% split between various other non-practicing entities and operating companies. 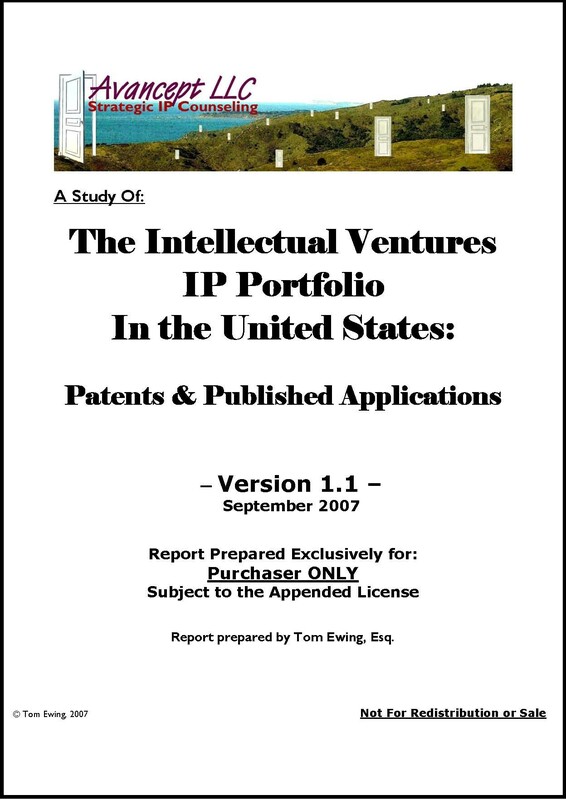 As discussed in our Intellectual Ventures Reports, IV has rapidly assembled one of the world’s largest patent portfolios. The company publicly acknowledges 30,000 “invention assets”* and is rumored to boast even higher numbers privately. We conservatively estimate that IV controls in excess of 10,000 patent families* which likely amounted to some 30,000-60,000 directly controlled patents/applications* worldwide by the end of 2010, although this number could range even higher depending on factors such as the company’s international filing preferences. Version 2.4 also identifies more than 3,000 patents/applications that appear to be allied with and/or controlled by IV. In addition to the company’s IP arbitrage activities, our report discusses IV’s corporate organization and its philosophy of “invention capitalism.” We also provide information about the company’s few technology development and spinout activities, as well as licensing and commercial development. The latest report also expands on the information we previously provided about IV’s funding sources. Avancept applied the skills and techniques mastered through more than 30 years of experience in law, business, technology, and journalism to uncover the information presented in these reports. We are now pleased to offer these reports of our detailed findings. Intellectual Ventures was founded by Nathan Myhrvold and Edward Jung in 2000, “driven by the belief that invention is the highest-value and most interesting part of the commercial food chain.” Myhrvold formerly served as Microsoft’s chief technology officer, and Jung was Microsoft’s chief architect. Intellectual Ventures has been organised to invest in innovations and technologies across a broad spectrum of industries – everything from computer hardware to biotechnology, and consumer electronics to nanotechnology. IV appears to have become the world’s greatest IP arbitrageur. In more than 950 transactions (by our most recent count), the company has acquired inventions and related IP from a combination of corporations, individual inventors, government agencies, and universities. In addition, IV has contracted with numerous inventors to develop its own targeted IP, much of which is still pending in various patent offices around the world. IV claims to be one of the top 50 patent filers in the US. IV has also struck agreements of various sorts with universities throughout the developed and developing world. This process of IP asset acquisition, comprised of buying, licensing, and creating IP worldwide, has given IV one of the world’s large portfolios in just a few short years of active acquisition. To finance these IP acquisitions, Intellectual Ventures has raised more than $5 billion from companies such as Microsoft, Intel, Sony, Nokia, Apple, Google, and eBay, as well as various financial investors, according to published reports and documents revealed in legal proceedings. Intellectual Venture’s corporate investors typically receive a royalty-free license to the portfolio in exchange for their investment. Intellectual Ventures has been at the forefront of efforts promoting invention per se as a legitimate business in its own right. Myhrvold believes that a viable and socially beneficial business can be based on the commercial exploitation of invention alone. IV represents one of the greatest exemplars to date of the post industrial “open innovation” business model. Read more by clicking one of the links below. * Notes: Invention Assets – IV uses this neologism to describe its intellectual property. We assume that this phrase refers to patents, applications, unfiled invention disclosures, and other technology-related trade secrets. Patent Families – refers to a set of patents/applications that relate to a common priority document; for example, one patent family might comprise six patents in six different countries. Patents/Applications – an exclusive right granted by a government to an inventor (or owner) in exchange for public disclosure of an invention. The number of patents/applications held by a company plus the number of “patent families” into which those patents/applications are grouped can provide helpful information about the characteristics of the overall portfolio. Read More About the Intellectual Ventures Report, 2nd Ed. Read More about the Intellectual Ventures Report, 1st Ed.